A number of the objects we see in the sky are not stars, but the remains of stars that have died. Manny of these stellar remnants have unusual properties, making them some of the most interesting and exciting objects for astronomers to study. When a Red Giant dies, the heat and pressure from its core ejects the outer layers of the star into space. These outer layers become known as a planetary nebula. Because of the intense fusion reactions that take place inside stars, planetary nebulae tend to be made up of more than just hydrogen. Helium, carbon and small amounts of other elements can also be found in them. These elements are blown back into the interstellar medium, enriching it with more heavy elements. More heavy elements in the interstellar medium means more heavy elements being pulled into future protostars. The more of these elements a star pulls in as it is forming, the more likely that the star will also form planets. 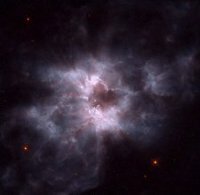 The exposed core of a Red Giant that is left behind after the formation of a planetary nebula is known as a white dwarf. In a white dwarf, the force of gravity compressing the star is balanced by a electron degeneracy pressure. This pressure occurs because subatomic particles like electrons don't like to share the same space. Once gravity has collapsed the atoms of the star so close together that their electrons can't get any closer, this pressure from the electrons is enough to keep the star from collapsing further. White dwarfs are very hot and bright, but very small. Although they may have about as much mass as our sun, even after ejecting most of their mass as a planetary nebula, they are compressed to a tiny ball about the size of the earth. Since white dwarfs are created from the cores of red giants, they are composed of elements like carbon, oxygen and neon. Fusion has already ceased in White Dwarfs, which means that they will slowly cool until they no longer give off light. Like Red Dwarfs, however, their lifespan far exceeds the age of the universe, which means that no White Dwarfs are old enough to have stopped shining. When a supergiant can no longer maintain equilibrium, it undergoes a sudden catestrophic collapse. A supergiant's core is so massive, that even pressure exerted by the electrons can't support the force of gravity. The atoms in the core collapse, leaving nothing but their atomic nuclei. This collapse creates a massive shock wave that rips the star apart in a massive explosion called a supernova. The massive amounts of radiation released during a supernova makes them so bright that they are generally some of the brightest objects in the sky, though they fade in a number of weeks. The tremendous amounts of energy released in a supernova are enough to fuse additional particles into the nuclei of heavy elements such as iron and nickel. Thus, supernovae are responsible for most of the elements heavier than iron, such as tin, gold and lead. Once a supernova has subsided, the dust and gas forms a large nebula where new stars can form. As with planetary nebulae, supernovae blast heavy elements into the interstellar medium that will eventually form into new stars and planets. Although the blast from a supernova sometimes destroys a star completely, usually the core of the star remains. Since the electrons were stripped from their atoms during the core collapse, most of the protons in the star end up absorbing an electron. The positive charge of the proton and the negative charge of the electron cancel each other out, and the resulting particle becomes a neutron. Since most of the matter in the core is converted into neutrons, they are known as neutron stars. Like white dwarfs, neutron stars resist gravitational collapse with degeneracy pressure, in this case, neutron degeneracy pressure. Since the nucleus of an atom is much smaller than the atom itself, gravity is able to compress neutron stars even smaller than white dwarfs. 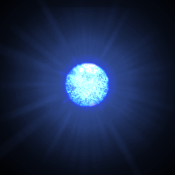 In fact, while a white dwarf may be the size of the earth, a neutron star may be only 24 kilometers across. Though small, they can have a mass of up to twice that of the sun, making them incredibly dense. Neutron stars spin very rapidly. Some of these stars emit beams of electromagnetic radiation out of their magnetic poles. Like the earth's magnetic poles, they don't always line up with the star's axis. This causes their beams of radiation to spin, much like the beam of light from a lighthouse. If these beams pass over the earth, they appear as a constant pulse of x-rays and radio waves. These neutron stars are known as pulsars. 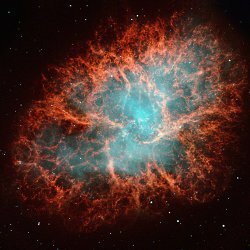 If the core left behind after a supernova is massive enough (probably about two or three times the mass of the sun), even the star's neutrons aren't strong enough to resist the force of gravity. These stars collapse into black holes. A Black hole is so small and so dense that not even light can escape from its gravity. Even though we can't see black holes, since they neither produce, nor reflect light, astronomers can still detect them. The gravity from a black hole can bend the light from other stars, like looking at light through a lens. Black holes can also be spotted if there are other nearby stars from which the black hole can pull matter. As this matter is drawn into the black hole, it begins to spiral around it like a whirlpool. 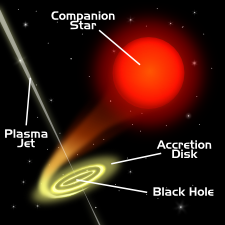 This spinning matter is called an accretion disk, which heats up and glows brightly. Many of the brightest objects in the universe are thought to have formed in this way, with a black hole in the center of a huge mass of spinning matter.